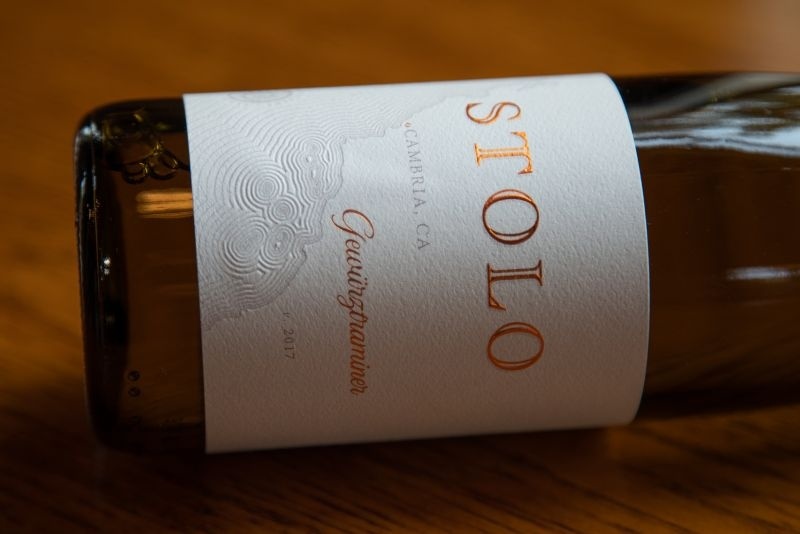 Stolo is one of two wineries who use grapes grown in Cambria. 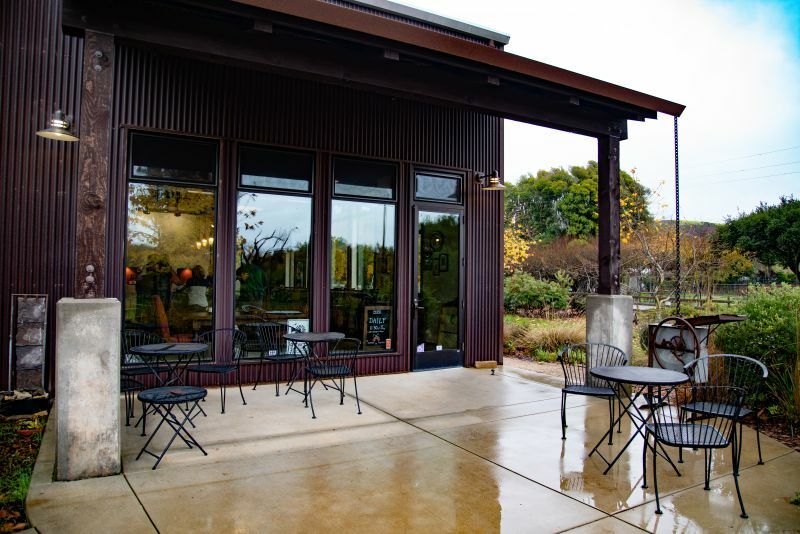 Their tasting room is at the vineyard property. Leaving Highway One at the Southern end of Cambria, the turn-off to the winery is a few hundred yards from the junction. The vineyard is about three miles from the coast, as the crow flies. 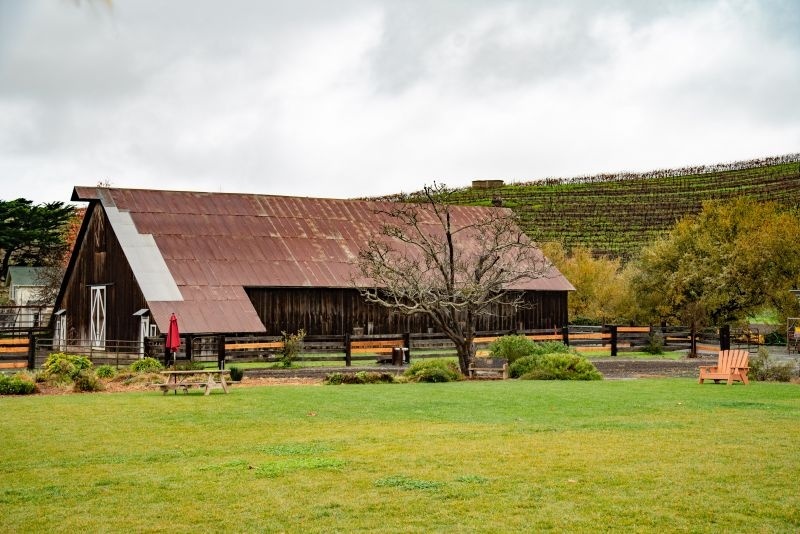 View of the barn from the tasting room. The current owners bought the business in 2002. All their wines are from estate fruit. Stolo makes about three-thousand cases per year. Compared to Napa, they pick fruit late in the year. Their first pick was after the first week of September. They use native fermentation; so using the naturally occurring yeast in the vineyard. The vines at the level of the tasting room are dry-farmed. The vines on the slopes benefit from some irrigation. 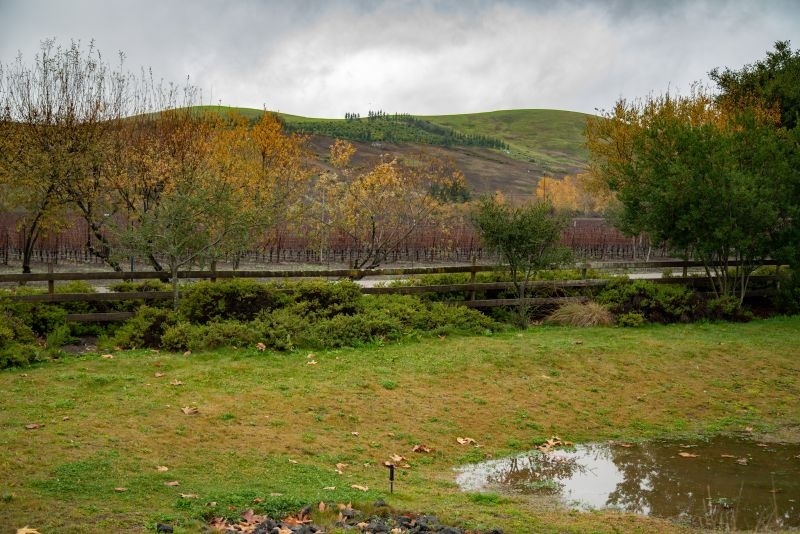 View of the vineyards and hills surrounding the property. 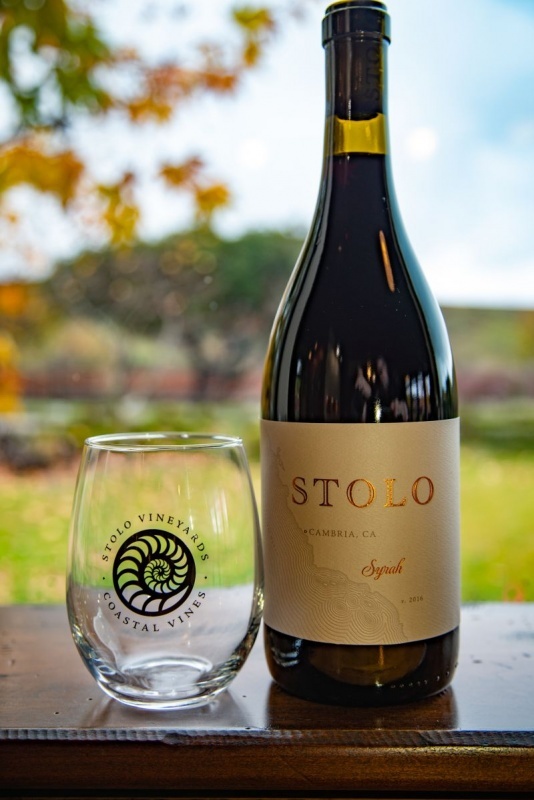 The Stolo winemaker is Nicole Pope. She has held this position since 2011. Among her previous roles was working as an Enologist at Domaine Carneros. The tasting fee is $15 per person. With the fee waived on the purchase of two bottles. The wines on the tasting list vary between $25 and $54. You can also all but one of the wines on that list by the glass; at $10 or $12. The tasting menu has brief tasting notes for each wine. I find these a little irritating. I want to approach the wine with an open mind; not influenced by the opinions of others. When we visited Cutruzzola, they made a point of having removed tasting notes. The dry Gewurtztraminer was delicious. There were two white wines on the menu. The first was the 2017 Gewürztraminer ($25). The nose was floral, fragrant, with aromas of stone-fruit. Taking a sip was surprising, in a good way, with minerality and subtle fruit. The aromas may have suggested a typical off-dry or sweet Gewürztraminer, but the wine was bone-dry. Tropical fruit notes and balanced acidity makes the Chardonnay a good sip. 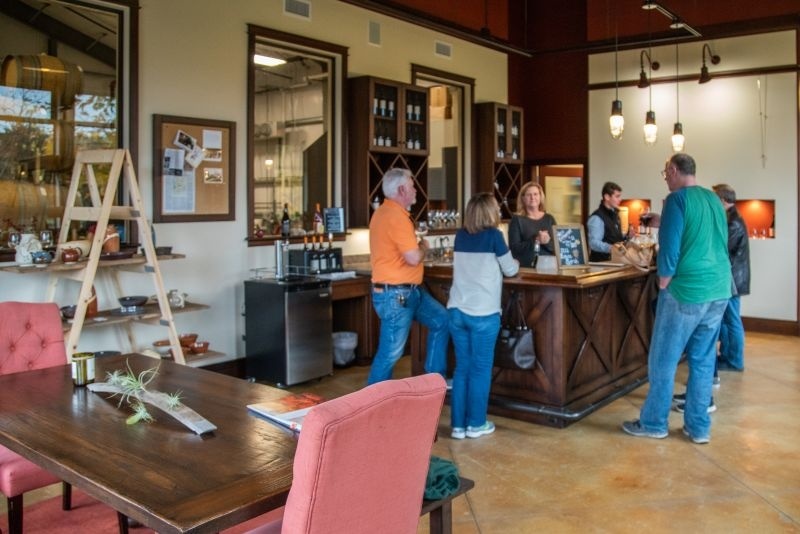 I have written before at the frustration I feel when tasting rooms serve white wine too cold. 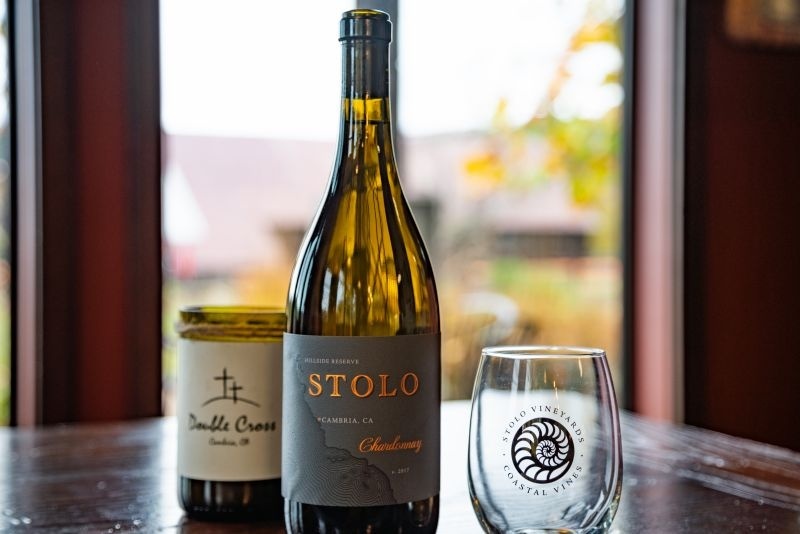 In the case of Stolo, I can forgive them for an over chilled Chardonnay. They had taken it from a fridge, as their cooler for Burgundy bottles was broken. They warned us in advance that we needed to warm the glass in our hands. A nose of vanilla and pineapple was the reward for a little patience. Flavours of oak and apple were supported by good acidity. The finish exposed citrus notes and an austere minerality. The vines for this wine were planted in 1998. The wine ages in 25% in new French Oak. The 2016 Estate Hillside Chardonnay sells for $38. The first of the red wines was the 2016 Estate Pinot Noir ($46). The nose was rich with smoke and pomegranate. Assertive acidity overwhelmed the initial soft mouthfeel. The flavour profile was predominately earthy, with raspberry notes in the background. The finish was medium length and left a taste of sawdust in the mouth. The Pinot spends ten months in 205-30% new French oak and a further twelve to eighteen months in bottle. The next wine was the Double Cross Red Blend ($28). The wine is a blend: 45% Syrah, 30% Pinot Noir, and 25% Petite Sirah. This last grape is not grown on the Stolo Estate, but from the Coyote Moon Vineyard in Paso Robles. The wine comes in a screw-cap bottle. Syrah notes of burning tyres dominated the nose. Distinct acidy, smoke, and earth were the primary flavours. There was a touch of fruit. However, the finish left one with a mouthful of acid and dust. The wine was interesting, but not satisfying. The fifth and final wine of the tasting was the 2015 Estate Hillside Reserve Syrah ($54). The burnt rubber notes were even more intense than in the blend. The nose also offered gamey meat aromas. Taking a taste I found subtle fruit flavours, earthy tannins, and balanced acidity. The lingering finish exposed raspberry, mint, mushrooms, and pepper. This was a complex wine and by far my favourite of the red wines. I found the white wines to be more enjoyable than the red wines. I thought that the Syrah was the only good red. However, it is far from a crowd pleaser, with its complexity and earthy notes.